Putting you in the game! 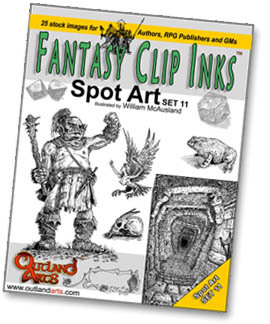 Outland Arts is a publisher of tabletop role playing game products, art, speculative fiction, art books, and stock imagery. The creators, freelancers and support staff form a collective of individuals from around the world who work together on a project by project basis to produce unique, lavishly illustrated, accessible and affordable merchandise. Gun Station Gamma Just Released! The shifting sands have once more revealed the great gun. Can your dig team survive the wastes to reach it? What secrets, ancient treasures and horrors will be found within? 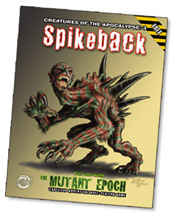 The 11th book for The Mutant Epoch RPG has just been released. 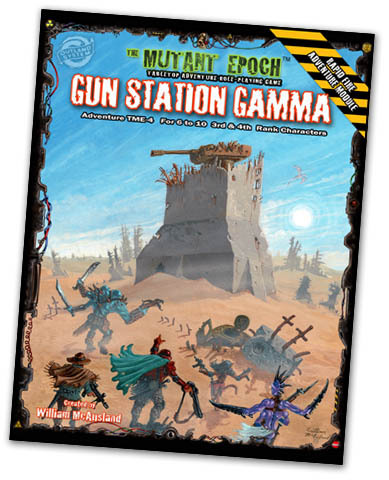 Gun Station Gamma is a 61 page ‘Rapid Fire’ adventure for 6 to 10 excavators of 3rd and 4th rank. This module takes place among rubble studded dunes, where thirst and junk storms can prove as perilous to the dig team as the occupants of the long-lost ancient military complex they seek. 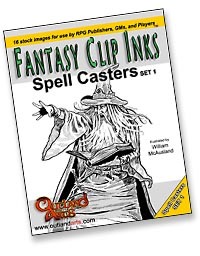 4 NEW sets of Fantasy Clip Inks Just Released! One Day Dig 8:: Baby Bupu Just Released! A quest for answers undertaken. While making their way to the far off ancient metropolis to undertake their next dig, the excavators come across a village in chaos. Their guardian, A rubble troll, seems to have gone mad, and ransacks the countryside, ruining the crops, damaging the houses and causing great worry among the inhabitants of Alnwick. With pleas for help, and a sizable offer of silver, the villagers recruit the passing diggers to discoverer the truth behind the behavior of the mutant monster - a normally peaceful monster that keeps away those that would eagerly wipe out the community if given half a chance. What perils and pitfalls await the adventurers as they investigate the countryside around the tiny farming town, and who or what is responsible for this calamity? This is our 8th One Day Dig, written by Tim Schuster, and is a Pay What You Want adventure suitable for both new and experienced players using characters of 1st or 2nd rank and can be placed in the Crossroads Region or the Game Master's own setting. It includes 2 maps, 14 illustrations, and is 14 pages in length. 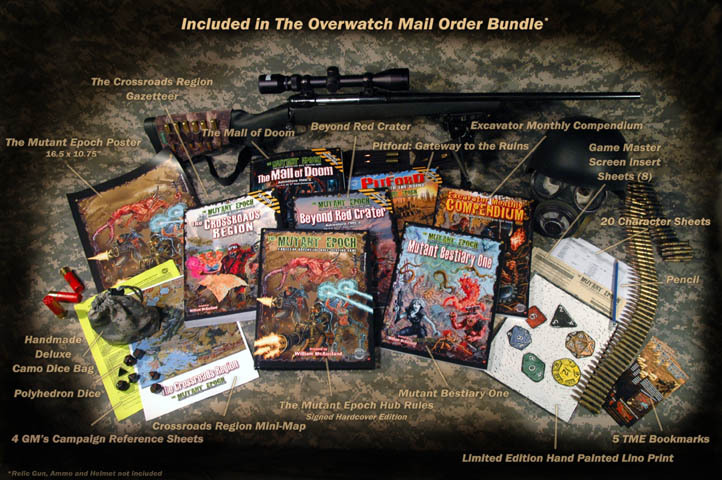 Stand by, Epochians, for yet more post-apocalyptic gaming goodness from Outland Arts. Dec 28th 2017 Gel-Bak, Creatures of the Apocalypse 21 Released! Even during expeditions into the ruins, always pack some wine and beer to trade – it could save your life! Our 21st Creature of the Apocalypse is here. This Pay What You Want, 10 page mutant freak can either be a cunning and brutish opponent, but at other times – so long as the travelers have booze to trade - can provide them with excellent intel on the local ruins or nearby wasteland. For those of you who have collected the first thirteen free critters, you'll notice two things. First, where are creatures 14 to 20, you ask? 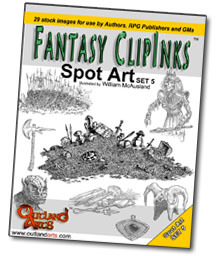 Well, they're included in the Creatures of the Apocalypse Codex, a for purchase book (pdf $9.99, print $19.99) which includes the 13 free critters, plus the Muto Harpy (members only creature) plus 6 all new, highly detailed freaks including The Walking Mouther, Rubble Troll, Snaykin, Nubinz, Apocalypse Moth and the Spider Lord. Curious? See it here. Secondly, we've pushed this PDF as a 'Pay What You Want' release, and while most people grab such online content on a try before you buy, 'free' basis, we hope that if you like what you see you can throw some coins in our tip jar. 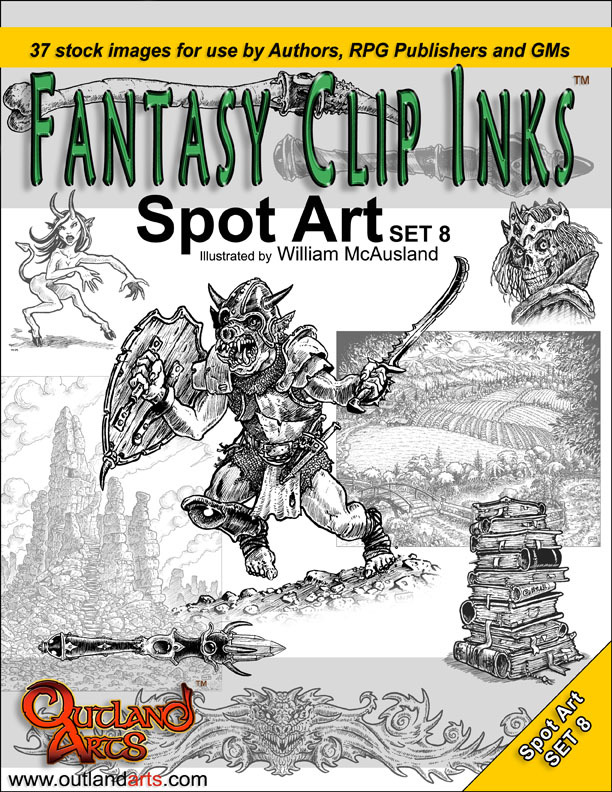 August 10th 2017 Fantasy Clip Inks Spot Art set 8 Released! 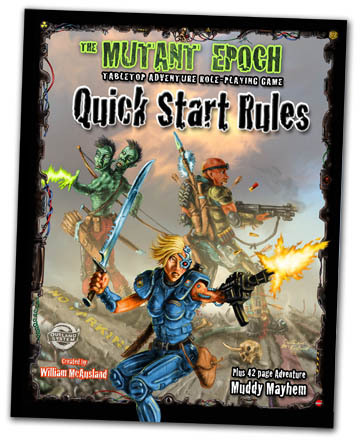 December 16th 2016 The Mutant Epoch RPG Quick Start Rules Released! 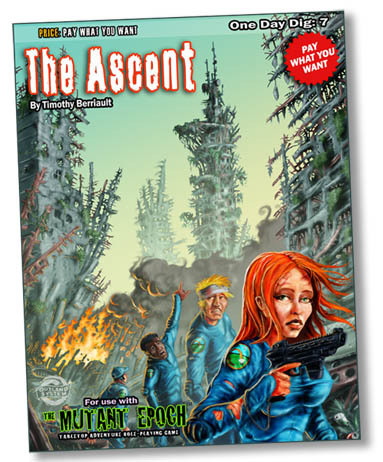 July 17th 2016 One Day Digs 7: The Ascent Released! 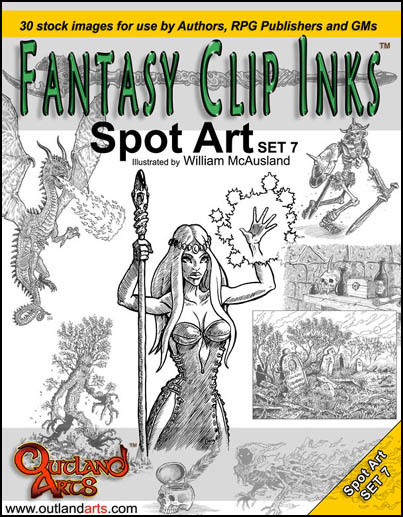 April 29th 2016 Fantasy Clip Inks Spot Art set 7 Released! 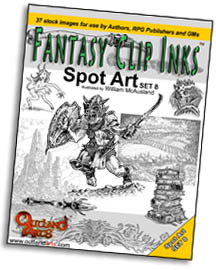 Spot Art set 7 includes 30, 300 dpi tiffs for indie authors, gamers and publishers to make their books and web sites look great. In this zipped folder we've included a tree ent, gorgeous sorceress, fire breathing dragon, zombies, a two animated skeletons, wraith, wizards, djinni lanterns, sorcerer's book shelves and scenes of daring adventure parties and much more! See the demo PDF to view everything included. These spot images can be modified to suit the publisher’s needs. See the demo PDF to view everything included. These spot images can be modified to suit the publisher’s needs. 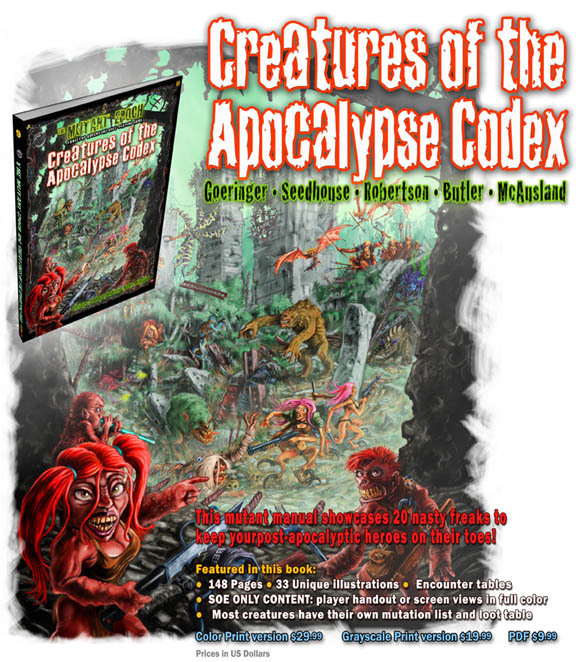 December 16th 2015 Creatures of the Apocalypse Codex Released! 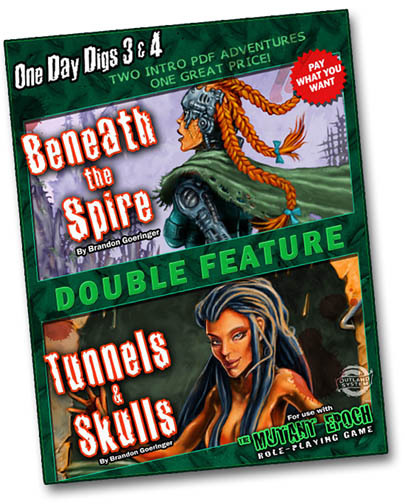 July 5th 2015 One Day Dig 6: Hunt in the Dark Released! Weary and thirsty, your dig team arrives in the tiny village of Rust Haven just in time to save the day! Beasts have attacked the village and while the militia chases them off, Black Scavenger, an ambitious bipedal rat mercenary, has escaped from the jail. He and with his thugs fled into the ruins beneath the community! With Rust Haven’s best fighters out in the wastes, the people of the settlement need you to go into the ancient depths and bring the villain, Black Scavenger, to justice, dead or alive. What horrors, curiosities and artifacts your team will find below the earth are unknown, but this is what you live for. You are excavators and post-apocalyptic heroes. 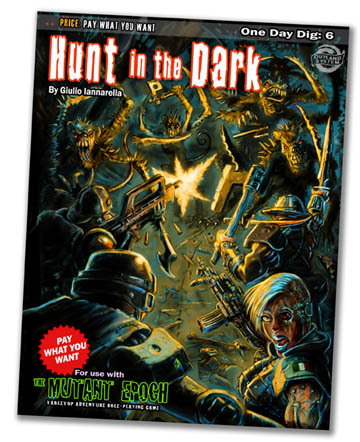 Hunt in the Dark is our 6th One Day Dig for The Mutant Epoch RPG and was written by Giulio Iannarella. Why not show your support to this new RPG author by throwing a few coins in the tip jar? In this 15 page Pay What You Want product is 1 full page player handout and 1 map, 25 illustrations, a mutant sub-species and two new relics. 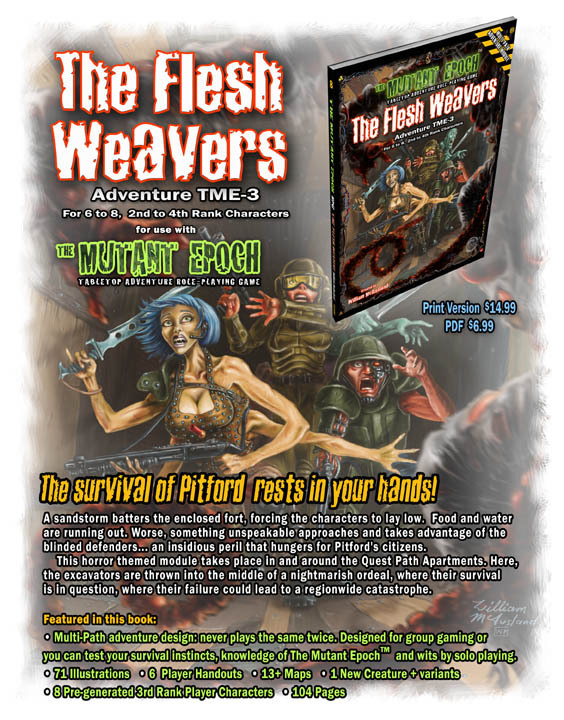 July 5th 2015 The Flesh Weavers Released! 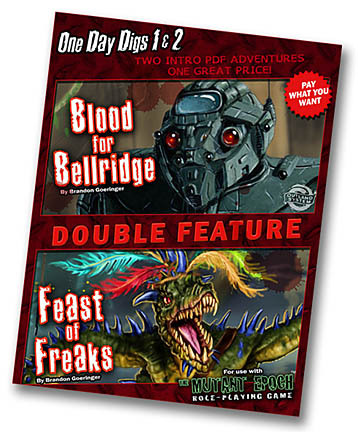 Return to a world of post-apocalyptic gonzo adventure with One Day Digs Double Feature 3 & 4! This evening’s first flick is irresistible, especially to those cyborgs in your team! Beneath the Spire will electrify your PCs, then, after a short intermission, dim the lights for Tunnels & Skulls, a post-apocalyptic random sewer generator! 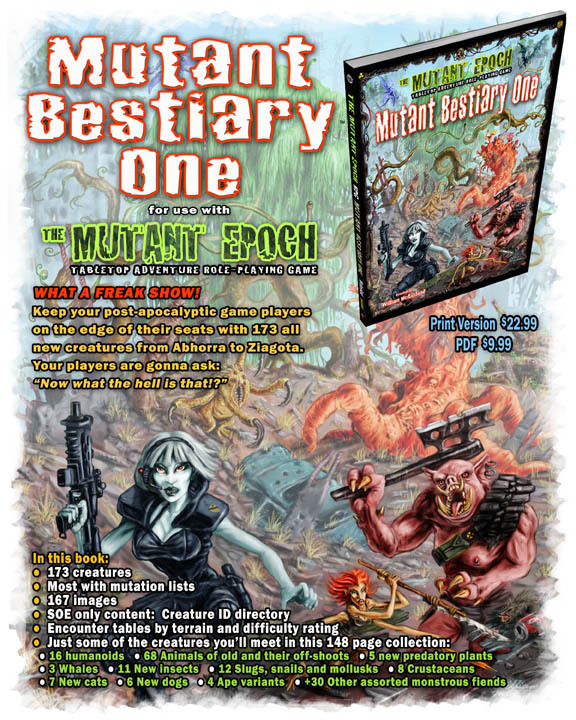 December 3rd 2014 Mutant Bestiary One Released! 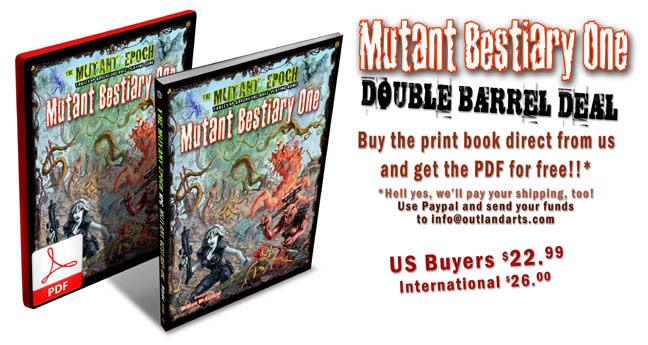 Buy the Mutant Bestiary One print book and get the PDF for free! US customers can send $22.99 usd, or International buyers $26.00 usd via paypal to info@outlandarts.com . Make sure you tell us your mailing address for your print book and your email address to get your free PDF right away! 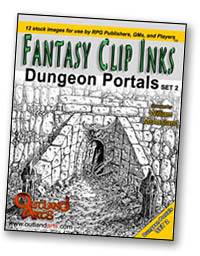 Two Pay What You Want PDFs Released! Step into a world of post-apocalyptic gonzo adventure and find out! Introducing the One Day Digs Double Feature. Starting off with a bang, our first quest is Blood for Bellridge, followed up after a short intermission by Feast of Freaks! Designed for introductory games at conventions, game stores, and private home tables, One Day Digs are the brain child of author Brandon Goeringer and illustrated by Will McAusland. They are crafted to showcase a bit of The Mutant Epoch setting and flavor, introduce some creatures and relics, as well as offer an example of how the Outland System game mechanic works. For the most part, these adventures are for 4 to 6 new PCs of first rank. Your Excavators fight hard in the wastelands, ruins and emerging barter villages, why not let ‘em see some reward? 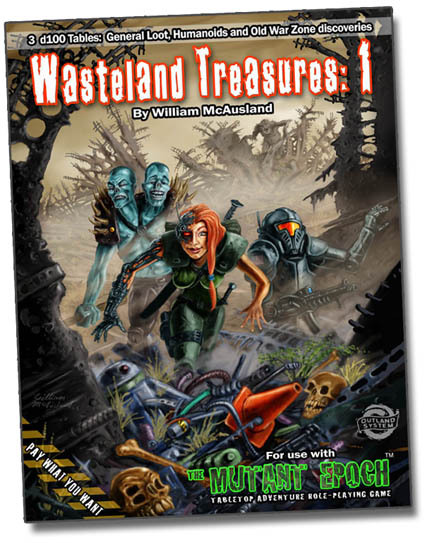 Here then, in Wasteland Treasures One, you’ll find plenty to keep them challenged, well paid and keen for the next expedition. Included are three d100 Loot tables: a General Ruin Treasure Table, an Old Warzone listing and trophies and curiosities carried by humanoids such as Skullocks, Warmorts, and Moaners. For use with The Mutant Epoch or other post-apocalyptic RPG, this 19 page PDF is perfect for the busy game master who needs to quickly access location appropriate items. The Old Warzone table, however, is far more than a list of goodies and rewards for player characters. 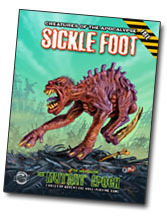 It’s got both dangers and adventure hooks built in, including landmines, rogue robots and the ever hazardous chem storm. 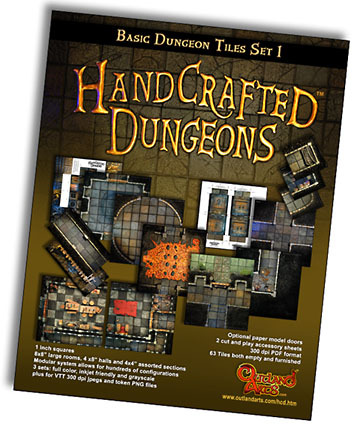 Handcrafted Dungeons:: Basic Dungeon Tiles Set 2 Just Released! Basic Dungeon Tiles set 2 can be used alone, but we recommend adding it to set 1 as the first set contains more standard corridor sections as well as entrances from outside into the underground realms you create, plus, 4x4” end caps or ‘dead end’ sections to avoid running a dungeon off the table. By combining sets 1 and 2, the possibilities for truly enormous dungeon complexes can be achieved, thrilling your players and making for miniature games they won’t soon forget. For VTT (Virtual Table Top) play, we have included a zipped folder full of all the floor tiles as 300dpi JPEGs, along with the accessory tokens as PNG files. Print on demand option and combo set coming soon! 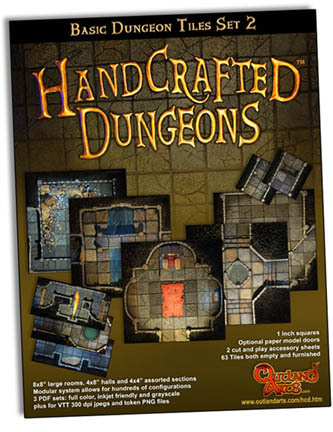 Handcrafted Dungeons:: Basic Dungeon Tiles Set 1 Just Released! You've spent countless hours painting your fantasy miniatures to look their best, why not play on some of the best looking gaming tiles? 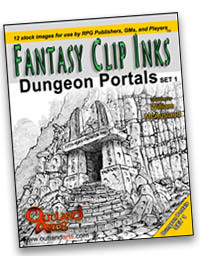 This line will start with Classic Dungeons sets 1 and 2, and will be followed by Caverns Set 1 which is in production. 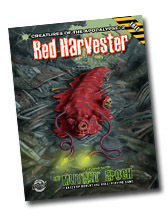 Get your FREE PDFs of mutant monsters! Click the cover to go direct to the product page at RPGnow.com. Not a member there? Its free to join and free to download these freaks. 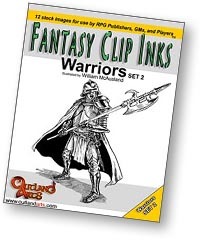 Two more Fantasy Clip Inks stock sets released today! 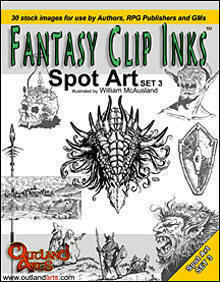 Spot Art set 5 contains a collection of 28, 300 dpi tiffs for indie authors, gamers and publishers to make their books and web sites look great. In this zipped folder are images A dragon in flight, dragon’s portrait, scrolls, a treasure hoard, skulls, humanoids, weapons, ornaments and a seedy little tavern, and much more! See the demo PDF to view everything included. These spot images can be modified to suit the publisher’s needs. 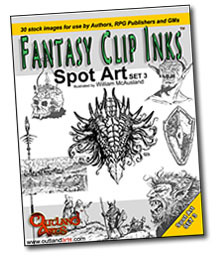 Spot Art set 5 contains a collection of 29, 300 dpi tiffs for indie authors, gamers and publishers to make their books and web sites look great. In this zipped folder are images of huge treasure hoard, a female liche, wizard’s hat, text scroll, skulls, humanoids, magic items ornaments and even a coastal town as seen from the air, and much more! See the demo PDF. 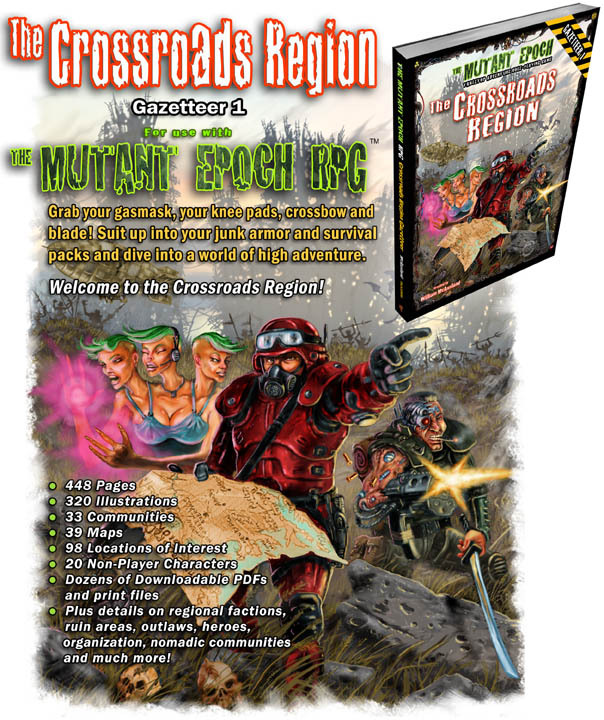 The Crossroads Region Gazetteer released today! 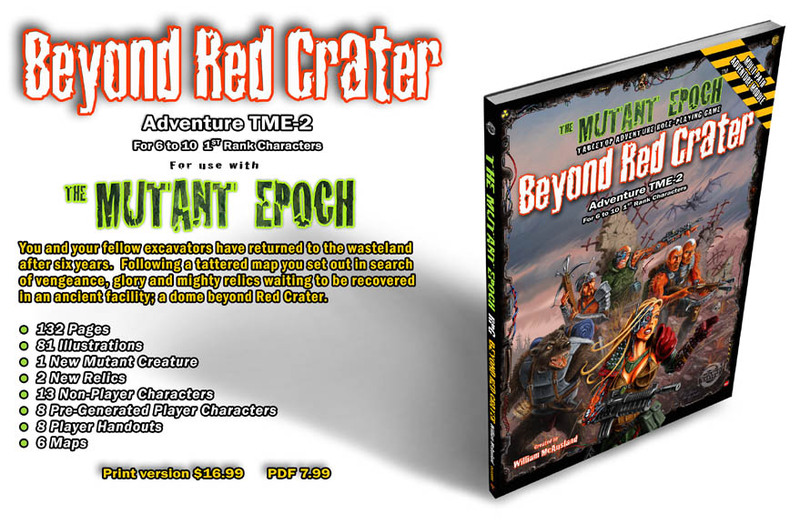 Beyond Red Crater just released! 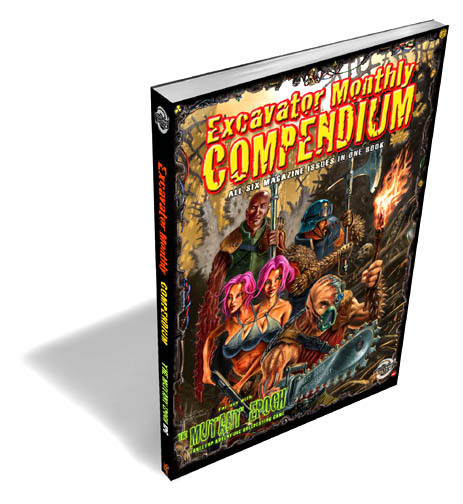 Excavator Monthly Compendium just released! Now you can get all six copies of Excavator Monthly Magazine in one book! Each article, relic, mutant beast, non-player character and other feature has been placed into categories within this hefty tome. Never forget a copy again. 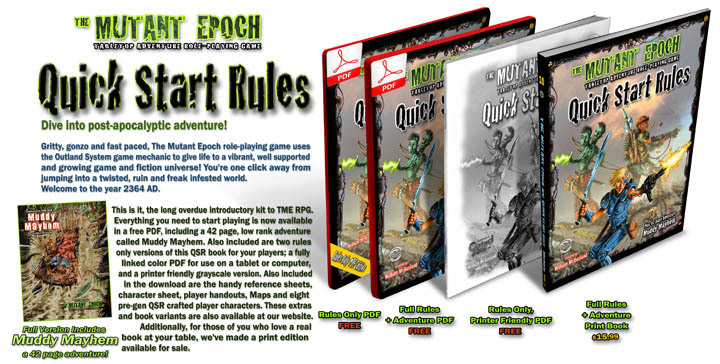 Both game masters and players of The Mutant Epoch role playing game can carry all the magazines in one handy book and quickly flip to any resource with ease. 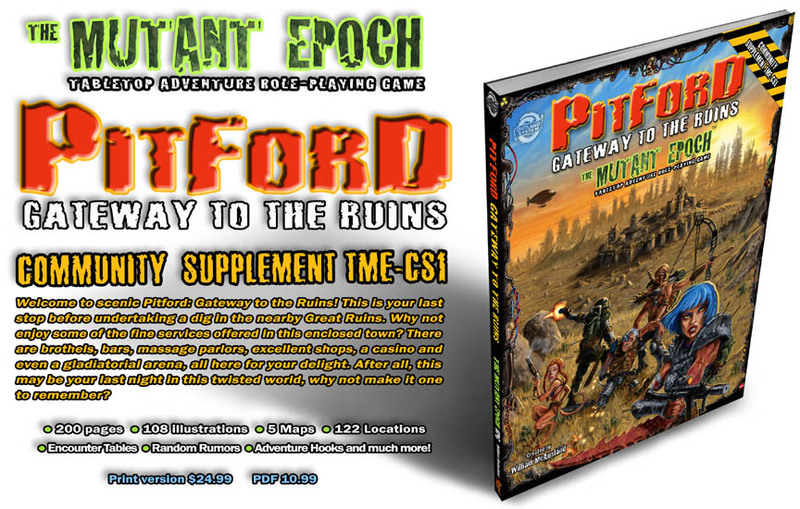 Pitford: Gateway To The Ruins released! 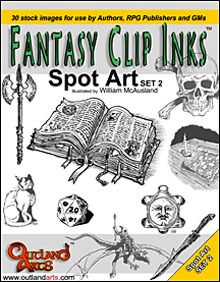 Spot Art set 2 contains a collection of 35, 300 dpi tiffs for indie authors, gamers and publishers to make their books and web sites look great. 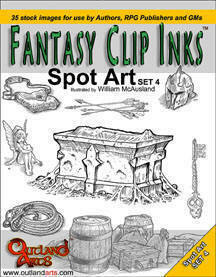 In this zipped folder includes a fairy, sleeping dragon on his hoard, barrels, keys, helmets, a ruined tower, more skulls, a banner graphic, locking book, bag of gems, crossed swords, grappling hook, rope bridge, a mysterious crypt and much more! This is our biggest spot art set so far. See the demo PDF to view everything included. These spot images can be modified to suit the publisher’s needs. 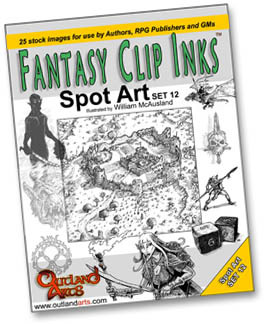 Some suggested uses are player handouts, ornaments for maps, chapter ending icons, magic items, treasure items and filler art to add a professional and creative look to any novel, game or web page. Excavator Monthly Issue 6 is here! Excavator Monthly Issue 5 is now available! 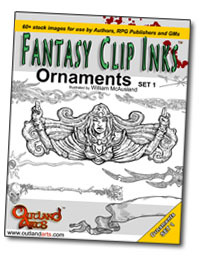 Another set of Fantasy Clip Inks is now available! 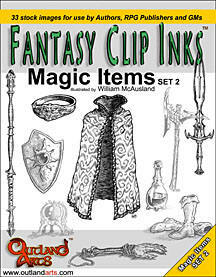 Magic Items set 2 contains a collection of 33, 300 dpi tiffs for indie authors, gamers and publishers to make their books and web sites look great. 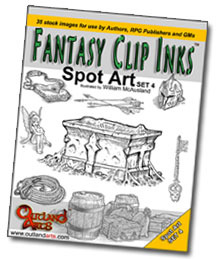 In this zipped folder are images for use as spot art or magic items for fiction, web graphics or games. 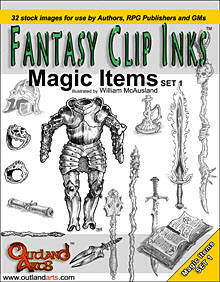 Set two contains more enchanted weapons, a magic cloak, boots, bracers, several jewels and medallions, plus more potion bottles, staffs, rods, wands, rings, enchanted armor items and another spell book and two scrolls, plus much more. These spot images can be modified to suit the publisher’s needs. Whether for personal use or publication, using these FCI images will Add a classical and creative look to your next novel, game or web page. 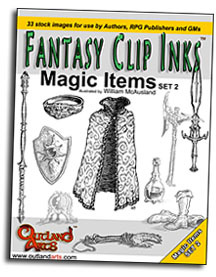 Magic Items set 1 contains a collection of 32, 300 dpi tiffs for indie authors, gamers and publishers to make their books and web sites look great. 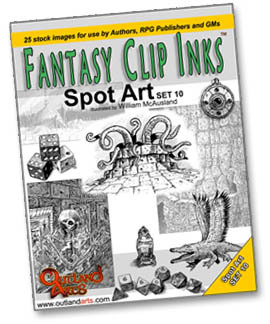 In this zipped folder are images for use as spot art or magic items for fiction, web graphics or games. 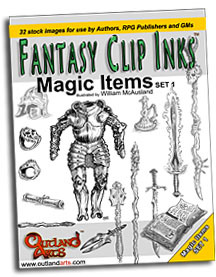 Included in this collection are potion bottles, staffs rods, wands, rings, scrolls, enchanted weapons and armor items, plus a spell books and assorted charms. These spot images can be modified to suit the publisher’s needs. Whether for personal use or publication, using these FCI images will Add a classical and creative look to your next novel, game or web page. 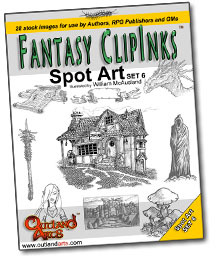 Spot Art set 3 contains a collection of 30, 300 dpi tiffs for indie authors, gamers and publishers to make their books and web sites look great. In this zipped folder are images of skulls, humanoids, characters, weapons, a wolf, bat, torch, distant town, ornate box, dragon’s head, and much more. See the demo PDF to view everything included. These spot images can be modified to suit the publisher’s needs. 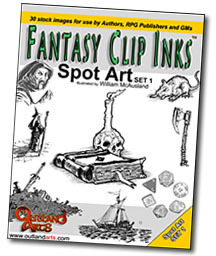 Some suggested uses are player handouts, ornaments for maps, chapter ending icons, magic items, new monsters, treasure items, NPCs and filler art to add a classical and creative look to any novel, game or web page. 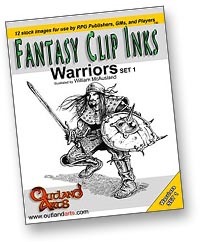 See the whole line of FCI stock packs, including Spot Art sets 1 and 2, Ornaments set 1, Warriors sets 1 and 2, Spell Casters set 1, Dungeon Portals sets 1 & 2, and many more here. 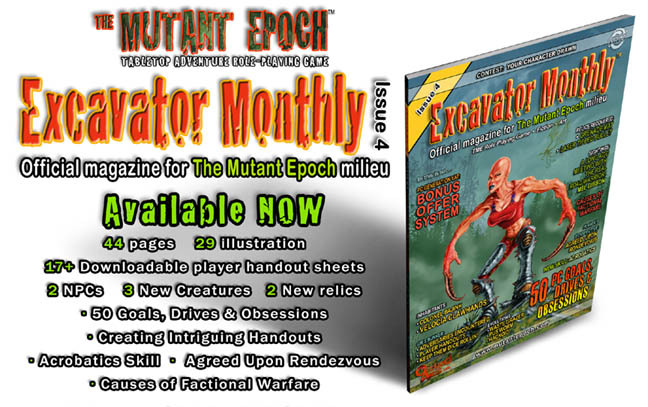 We finally we have a dedicated The Mutant Epoch Facebook page! Why not join us at http://www.facebook.com/TheMutantEpoch and get in on the discussions, meet other TME gamers, see art previews, read news and much more. We're on a roll! 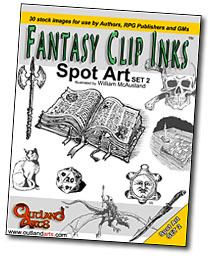 We've just released another set of Fantasy Clip Inks, Spot Art set two which contains a collection of 33, 300 dpi tiffs for indie authors, gamers and publishers to make their books and web sites look great. In this zipped folder are images of scrolls, humanoids, skulls, weapons, a 20 sided dice, imp, classic D&D troll, army, treasure map and candle, 2 outdoor scenes, dark lord on a winged mount, crown, cat, ring, and plenty more. See the demo PDF to view everything included. These spot images can be modified to suit the publisher’s needs. 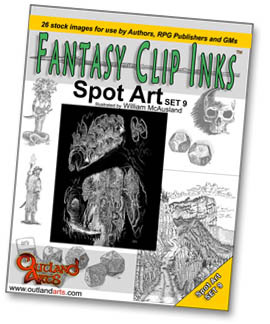 Some suggested uses are player handouts, ornaments for maps, chapter ending icons, magic items, new monsters, treasure items, NPCs and filler art to add a classical and creative look to any novel, game or web page. Copyright © 2018 Outlandarts.com All rights reserved. No part of this site may be reproduced or transmitted in any form or by any means, electronic or mechanical, or by any information storage or retrieval system.